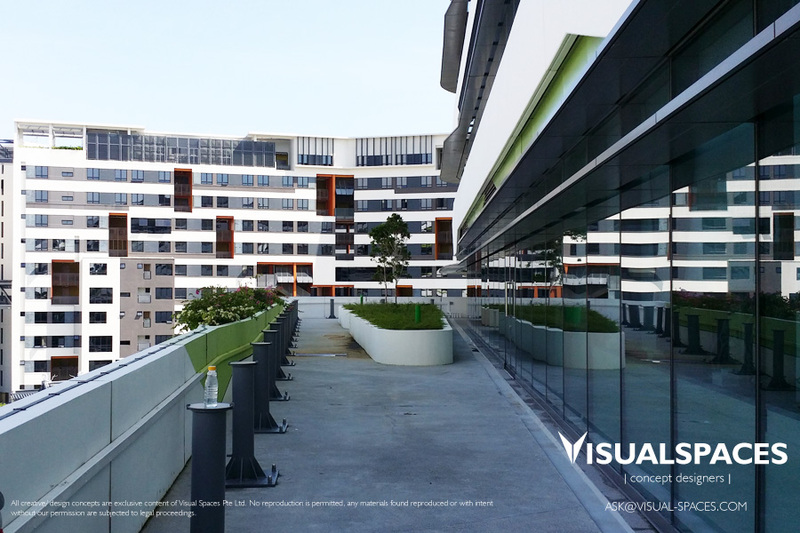 Visual Spaces was invited to explore and conceptualize an under utilized outdoor area at level 4 of a building block in Singapore University of Technology & Design (SUTD). Out client’s intention is to convert this space into an outdoor events area. 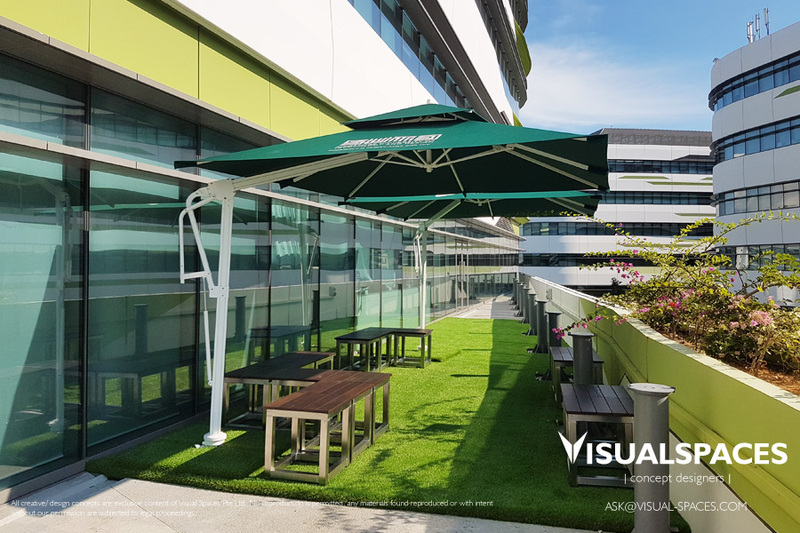 Existing Outdoor Space at Building 3, Level 4 of SUTD. 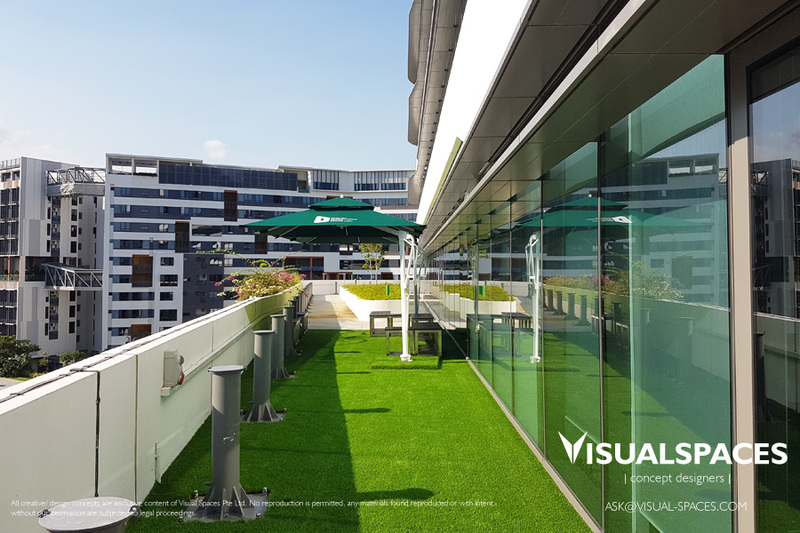 Visual Spaces conceptualized this space to blend in with the existing lush greenery environment exposed to the Sun and planters. 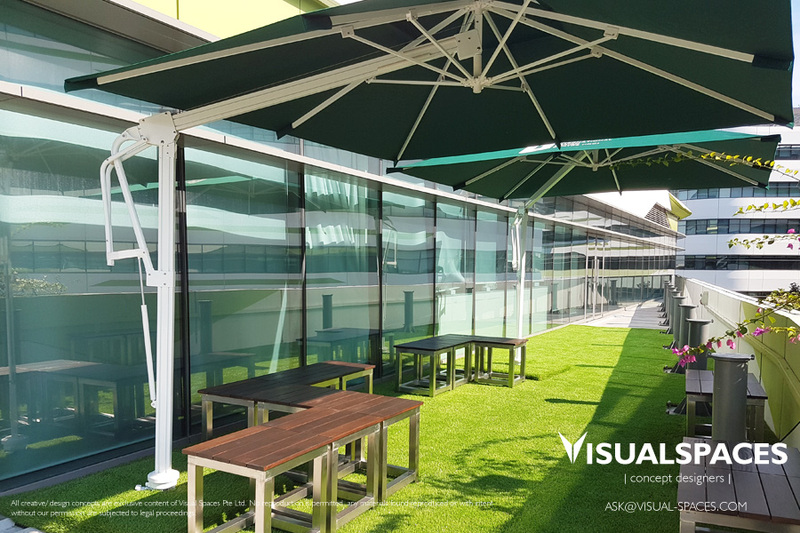 A designated space to conduct evening sessions of department gatherings or an afternoon of breakout sessions outdoor would be inspiring and informal. Adding more greens to this area, synthetic grass are applied on the floor. Parasols are added to provide shades from the Sun and custom outdoor ottomans to complete the styling of this space. Installation of drainage cells for synthetic grass on designated area. 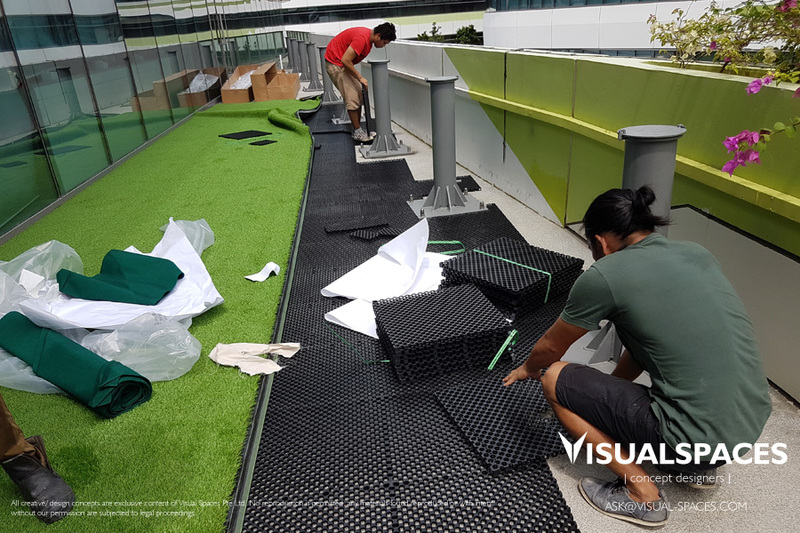 Considering this as an outdoor space exposed to rain, drainage cells are applied and laid on the existing floor to allow drainage from rains and cleaning of the raised synthetic grass. After drainage cells are installed, synthetic grass are then installed on top. Installation of Parasols to Provide Shades from the Sun. Parasols with SUTD & IDC Logos imprinted on Sunbrella Canvas are then installed with concrete base for support. Completed Space – View from Entrance Area. Completed Space – View from Seating Area. Completed Space – View of Custom Ottomans inside the Parasols. We hope you have enjoyed following the simple makeover process we have done for SUTD! Please look forward to our upcoming posts which we hope you gain ideas and know how our team professionally execute our projects! Interested to work with VS to design, renovate or style your office, education institutes or home? Contact us today! Be inspired by VS.